RIGHT: One big scavenger, the condor looks down from a perch. A captive whooping crane in a breeding pen at the International Crane Foundation. Causes: habitat loss, shooting for feathers for the hat trade, collisions and electrocution at power lines, avian tuberculosis, avian cholera and lead poisoning. Cause: DDT poisoning caused reproductive abnormalities and thinning of egg shells. (DDT breaks down into a chemical similar to the hormone estrogen, disrupting the endocrine system and causing the weak shells.) 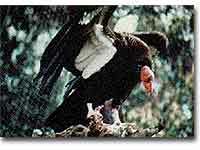 The Fish & Wildlife Service has proposed removing the bird from the list of endangered species. Cause: urbanization reduced open condor habitat; birds were poisoned by eating lead shotgun pellets and poisons aimed at other animals, and electrocution by power lines. There are 1 2 3 4 5 6 7 8 9 10 11 pages in this feature.